Sweetbreads are either the thymus/thymi of the animal in question (they tend to go away or at least diminish as the animal matures), or the pancreas. Glands. I spent some time surfing their preparation as in food preparation. Seems most people batter-fry them, if you go by what is posted on the net, which seems a taste-waste. I ended up with a few cooking ideas, and I went from there. Simmering them for about 20 minutes with some vinegar and salt, then removing their excess membranes (once cool enough) seemed like the basic basic. After that, you can plop them into your favorite sweetbread recipe, of which I’m sure you have many…. heh. Probably not, but I do assure you, these glands are tender and tasty. In the enclosed photo op: they were ultimately cooked with baby baby bok choy (nearly neo-natal) which I find at my local Asian market, a little leek, and Costco-provinced hearts of palm. 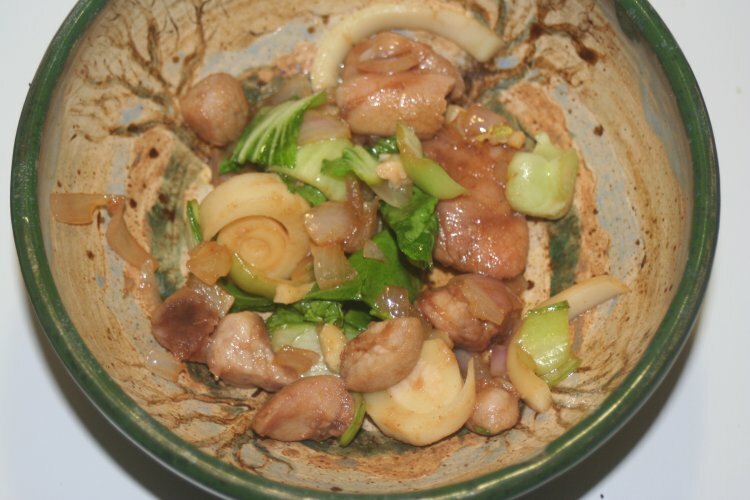 This entry was posted in Cooking and tagged Offal, Sweetbreads. Bookmark the permalink.